In the October issue of Crafty Carper there’s plenty to get your teeth in to with the likes of Dave Lane, Martin Locke, Shaun Harrison and Simon Crow to shout about you can be assured that there’s some cracking reading material, big fish and plenty of things to get your brain ticking and help you catch a few more carp this month. 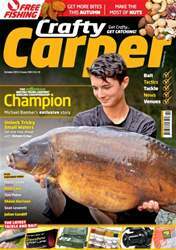 Tom Maker also gives his top tips for Autumn while Ellis Brazier looks at the use of nuts. There’s also free fishing for every reader at venues up and down the country and plenty of shiny new tackle and bait related items to ogle at.